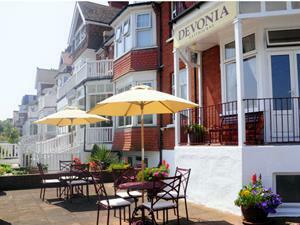 Devonia Guest AccommodationDevonia is a charming Victorian property situated in a superb location on Eastbourne's elegant seafront. The resident chef/proprietor and his wife, Terry and Carolyn Jane, have many years' experience in the hospitality industry and will ensure you have a relaxing, enjoyable and comfortable stay at Devonia. Devonia sometimes limits bookings to 3 or more days. A quiet twin bedded room at the rear on the ground floor has been stylishly decorated. There is a flat screen television with Freeview, tea/coffee making facilities, hairdryer and toiletries. The fully tiled en-suite facilities include a walk-in shower. Overlooking the South Downs at the rear, our quiet first floor bedroom has been stylishly decorated. The bed can be arranged as either a 6' superkingsize or two 3' twin beds, as preferred. There is a flat screen television with Freeview, tea/coffee making facilities, hairdryer and toiletries. The fully tiled en-suite facilities include a large walk-in shower. With large windows overlooking the sea and promenade our first floor double bedded rooms is stylishly decorated. There is a flat screen television with Freeview, tea/coffee making facilities, hairdryer and toiletries. The fully tiled en-suite facilities include a large walk-in shower. A double bedded room on the second floor at the side with sea view is stylishly decorated. There is a flat screen television with Freeview, tea/coffee making facilities, hairdryer and toiletries. The fully tiled en-suite facilities include a shower. room 8 sometimes limits bookings to 3 or more days.